The immediate challenge when listening to this new album from Red Sky July would be taking to it so effortlessly as their previous release SHADOWBIRDS. 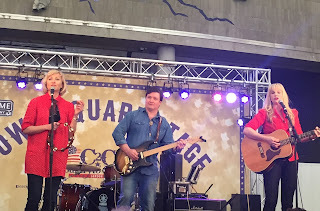 This 2014 record garnered much praise and landed the experienced trio an intriguing placement in the world of Americana leaning music. Of course good musicians and performers can evolve into a multitude of musical styles. Husband and wife pairing, Ally and Shelly McErlaine, alongside Charity Hair fell into this category and were able to mould their artistic talents of gorgeous harmonies and exquisite musicianship into a twang filled feast of lyric laden songs. It is proud to report that THE TRUTH AND THE LIE rolls out to be a seamless extension of their sophomore effort and presents itself as a luxurious listen. There has certainly been a buzz about the release of Red Sky July’s third album and it scores highly on many fronts especially in its exemplary band chemistry alongside a feeling that the songs will grow further from a lofty first impression. There are many attributes to feed the appetite of demanding music followers, with the band spinning a number of genre plates, probably more out of artistic instinct rather than any marketing pursuance. If anything it resides on the genre fault lines with shades of country, folk, pop and Americana. Nevertheless, the album emerges as a heady mix possessing the necessary traits to court wide appeal. The introduction of Red Sky July to me came via a support slot they played for Beth Nielsen Chapman just over two years ago and the two have re-united to play a significant part on this record. Beth gets her name on the sleeve credits for ‘Strathconon’, one of a number of ace tracks, and teamed up with Shelly to co-write two further songs. The input from one of Nashville’s most accomplished songwriters was probably invaluable. The same could also be said for the three other session musicians completing the studio line up adding the percussion, bass, Wurlitzer and pedal steel. Essentially however, Ally, with his many years of anchoring the guitar sound of Scottish rock band Texas, provides the stable base for Red Sky July to flourish and the two ladies who flank him on stage prosper in such surroundings. Charity also provides the fiddle input, but it is her vocal union with Shelly which really blossoms on the assortment of melody-blessed songs. This album, produced in the band’s own studio, is a delight for those seeking their long playing records in a neat and tidy format. Ten tracks of a similar length ensure that not too much of your valuable listening time is demanded, but cleverly the album maximises each second of its luscious optimum existence. It wastes little time in making a statement and is not afraid to steer into pop territory in the opening track ‘Jet Trails’, but this is far from definitive of the album’s core and soul. The strongest claim for this is the stellar closing track ‘Sway’ which reveals itself as a divine and classy piece of work rich in pedal steel and electric guitar. A potential popular song syphoned off for extra promotion is ‘Walking Country Song’. Admittedly this track took a few listens to grasp and shake off the slightly clichéd name dropping which forms its base. From being an initial risk to engage me, the value eventually appeared. There was no similar stuttering process for the stunning ‘In Black’ which saw all three band members get the sleeve credit, but Shelly get the press release writing nod for penning such an impressively structured composition detailing Ally’s well documented illness from a different perspective. Elsewhere the album bubbles with interesting tracks. Following the spritely opener, second number and title track ‘The Truth and the Lie’ comes across contrastingly earthy. Later in the record the band makes a brave attempt to create a slightly alternative engaging melody and succeed with the curious and partially acoustic ‘Earthwards’. The other Beth Nielsen Chapman contributions sparkle with song writing class, ‘Taking Myself Back’ slips easily into your listening sphere with a decent hook, while ‘Dodge’ contains some of the album’s most impressive guitar work. ‘Long Time Dead’ completes the offering and delivers the quintessential country ballad to a standard befitting an album steadily improving upon each listen. THE TRUTH AND THE LIE is truly a worthy follow up to SHADOWBIRDS. It stands up to stern scrutiny and showers countless positive attributes on the ears of listeners seeking the eternal music trinity of melody, vocals and instrumentation. 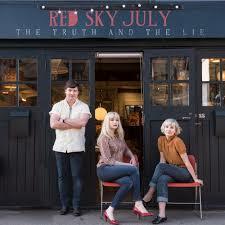 Red Sky July continue to be a trio successful in harnessing the talents bestowed on them and make music that runs far deeper than superficial appeal.